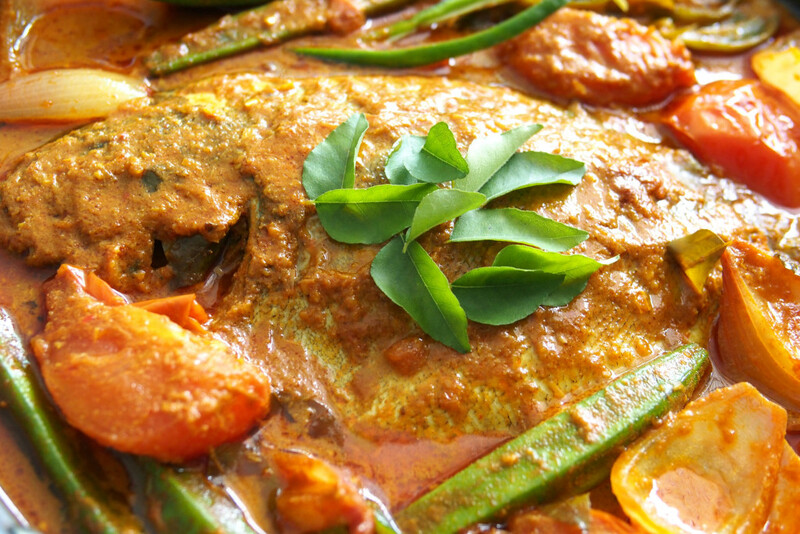 This is a Penang-Chinese style of fish curry cooked with some fresh blended herbs and store bought curry powder. You’ll find quite a few choices of curry powder at the grocery store. I usually choose either Ayam Brand or Baba’s brand as they are tried and true. 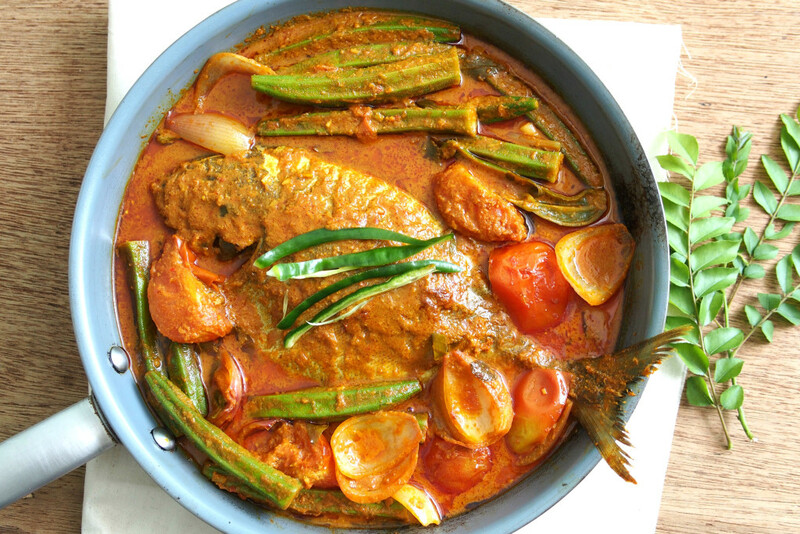 A large fish head or mackerel or black-pomfret works well for this recipe. I usually like to add a lot of vegetables like long beans, okra, tomatoes and egg plant. They all go very well in the curry. This time however, I only had okra and tomatoes but I do recommend more vegetables for a wholesome dish. 1. Clean or cut the fish into half or leave as whole. 2. Heat up oil in a pan or pot. Fry the curry leave and blended ingredients for few minutes. Then add in curry powder mixer and continue flying for another 1 or 2 minutes until the oil separate from the paste. 3. Add water, salt, sugar, lime juice and coconut milk. Once it starts to simmer, add okra, tomatoes and onion. Simmer for 2 to 3 minutes until the vegetables are cooked. 4. Remove only the vegetables from wok and put aside. Then put fish in the wok and simmer for around 10 minutes until the fish is cooked. If the gravy is too thick add water and adjust the taste. 5. Put back vegetables to the wok and stir well. Turn off the heat and dish out.